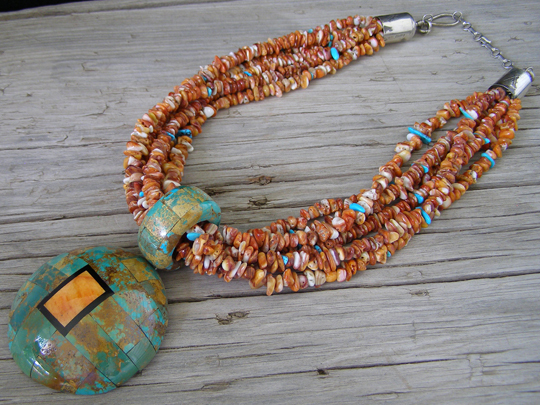 This stunning shell pendant inlay necklace is strung on six strands of orange spiny oyster beads with Kingamn turquoise highlight beads. This is a medium-sized shell of spiny oyster that has been inlaid with green Kingman turquoise richly mottled with brown matrix and has an orange spiny oyster Anasazi Window design. Neither as heavy, nor as costly as the large shell pendant necklaces that Chris sometimes makes, this sacrifices nothing in the sheer quality of the work. In fact, the superiority of Chris' inlay work is most apparent to the trained eye in his shell pendant inlay work. The reason is that he must actually carve out the back of each tile to concavity to make the tile hug the shell and fit perfectly with the other tiles with almost no trace of gap between the tiles. Other inlay artists use flat tiles for this work, then buff down the rough tiles to smoothness, leaving a gap between the tiles which is grouted. You won't see that on Chris' shell pendant inlay because each tile is painstakingly shaped on the back side of the tile to fit the convexity of the underlying shell and fit snugly against the abutting tiles with no grouting necessary. In the center of this pendant is an Anasazi window motif (see actual examples of Anasazi windows at Chaco Canyon). Simply superb and unparalled in its craftsmanship! CTN for Christopher Thomas Nieto and SDP for Santo Domingo Pueblo incised on the under side of the shell. Shell pendant: 2 1/2" across; 2 1/2" up & down; top of bale to bottom edge 3 7/8"